Just as the scent of a freshly baked apple pie brings back memories of our grandmothers, the sight of the Wolverine 1000 Mile Boot triggers the memory of my grandfather. Whether fishing, cutting wood, bailing hay, gardening, snapping beans, husking sweet corn or just sitting under the maple tree in the back yard listening to his stories with his lip full of Copenhagen, it was the masculine journey of a young boy’s summer. That’s what I love about the Wolverine 1000 Mile Boot Collection. It has a story, and it tells a story. It remains true to its own heritage, while embracing the heritage of another (Horween Leather Company) in honoring this classic collection of men’s fall boots. The reasons to own a pair of Wolverine 1000 Mile Boots are endless. The authentic style, craftsmanship, softness and tanning of the leather combine to compliment any man’s casual wardrobe. With 3 colors (black, rust, brown) to choose from, there is at least one color certain to find its spot in your shoe rotation. Why choose just one color of Wolverine boot when you could own all 3?! 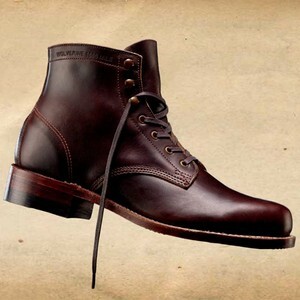 Wolverine 1000 Mile Boots are constructed with a classic hand-stitched Goodyear welt. Here is a list of retailers that sell the Wolverine boot. You can also find Wolverine boots on Amazon. I’ve been in the men’s clothing business since 1991. My specialty is custom-tailored suits and shirts, as well as men’s accessories. Stay up to date with what's happening on The Men's Fashion Guide. From Grooming tips & Accessories to ideas for Business & Casual attire... you'll always be the first to see these helpful tips as soon as we publish a new article.